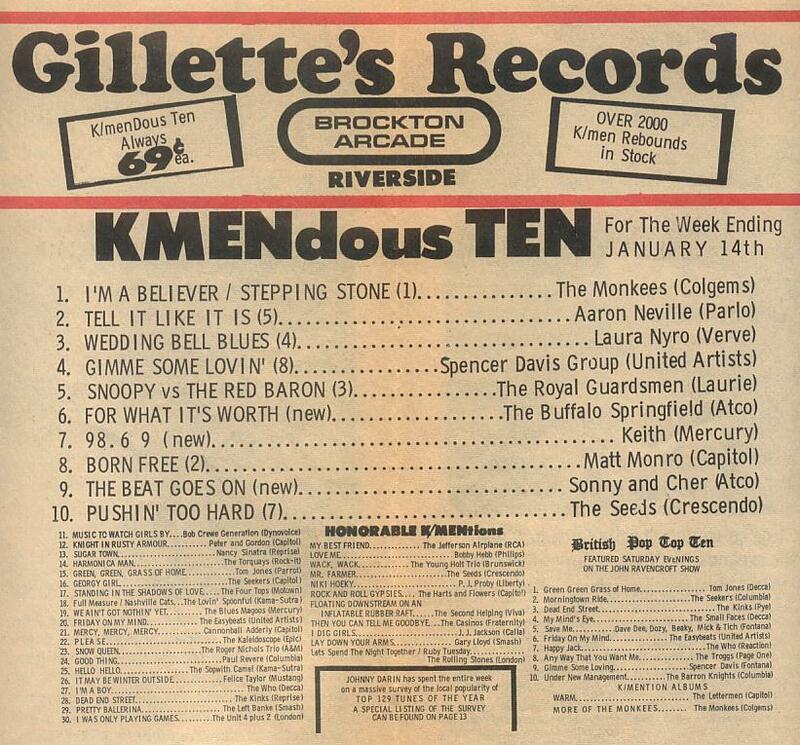 The KMEN British Pop Top Ten (sometimes was known as K/MEN British Pop Ten) was a feature on Peel's shows every Saturday on KMEN (John Ravencroft as he was known on the station) between February 1966 and February 1967. It is not currently known whether Peel played all or a few of the songs from the top ten on his shows. 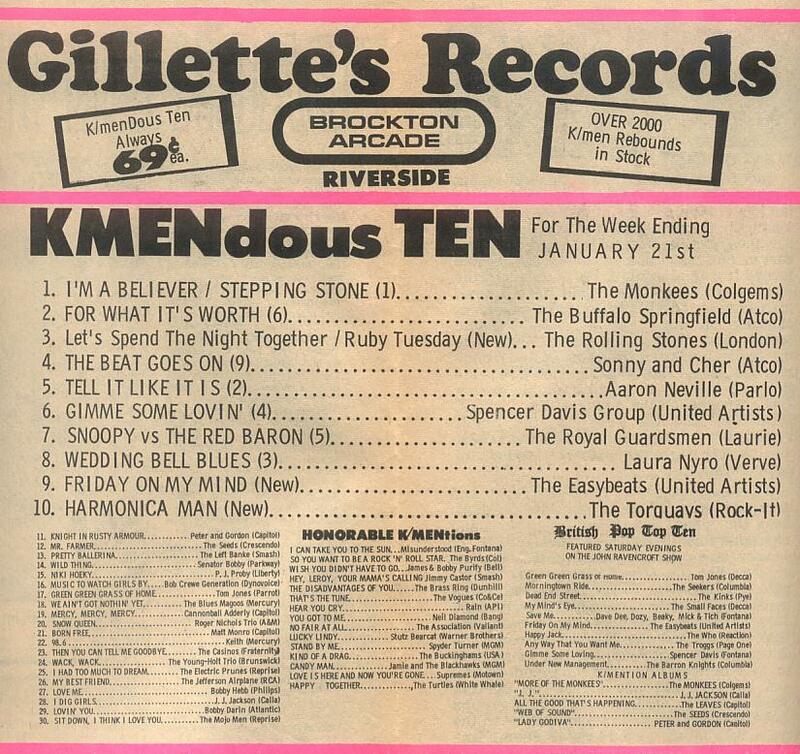 The KMEN British Pop Top Ten didn't seem to based on the charts by the Record Retailer, which was used by the official UK Singles Chart, but instead probably on the NME charts. Peel may have had copies of the NME sent from the UK to America, when doing the charts. 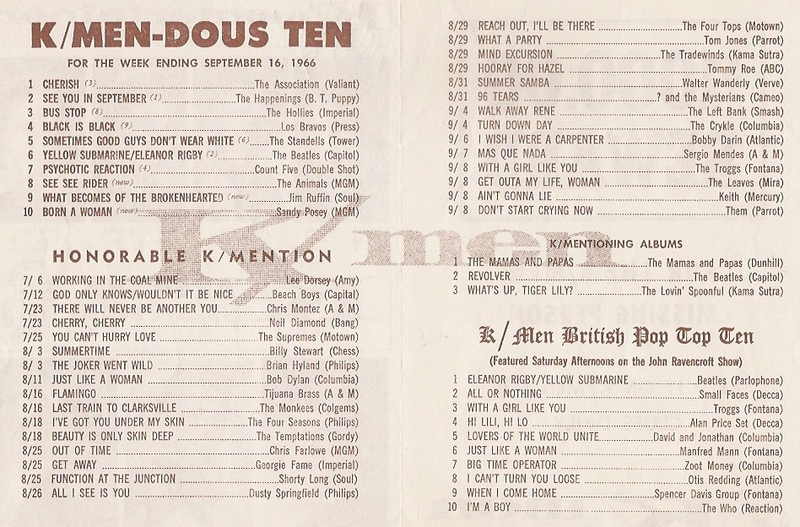 However, "officlal" charts were less important in the 1960s, with many commercial radio stations in the US and elsewhere (including the UK pirates Radio London and Radio Caroline) having charts of their own, and Peel may also have had access to the charts of the British music weeklies Melody Maker and Record Mirror. Most of the records in his Top Tens would be familiar to pop radio listeners in 1966, and, especially in the second half of the year, most of them are British - although there are also some US artists who had successes in both the UK national charts and those of the pirate radio stations, such as Herb Alpert, Nancy Sinatra, Lou Christie, Otis Redding and Bob Lind. Peel later claimed he manipulated the charts to include favourite records of his own, but available KMEN charts provide little evidence of this until July 1966, when "Making Time" by Creation was featured in the listing, despite failing to enter the UK Top 40 (although it was a pirate radio "turntable hit" and made the charts in Germany). 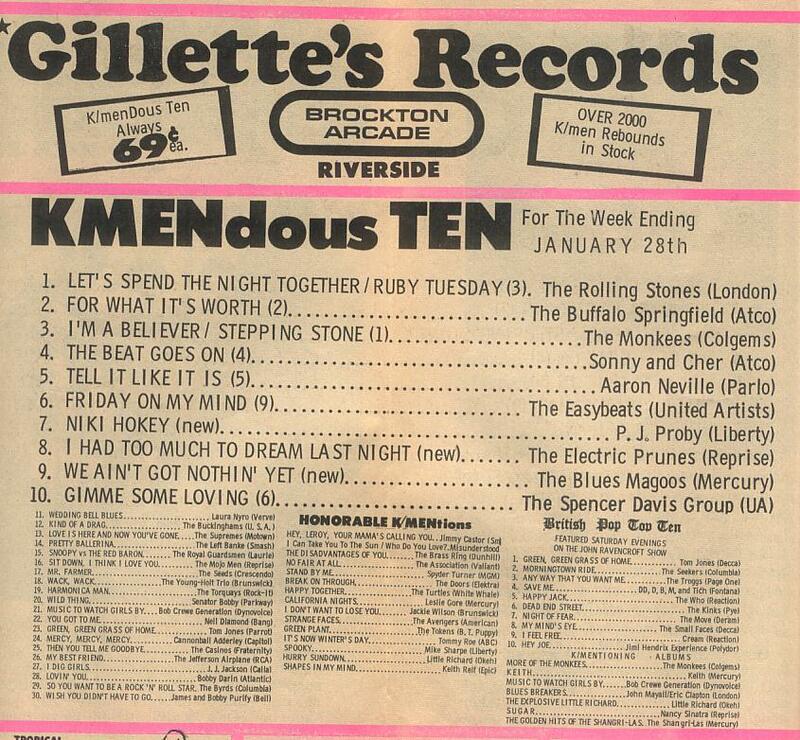 In the second half of 1966, sentimental ballads by the likes of the Bachelors and Ken Dodd vanish from Peel's chart in favour of more modern material, while the Who remain present in the British Top Ten without a break during his final months on KMEN. Singles by the popular live bands of Zoot Money and Geno Washington also appear in Peel's Top Ten; despite pirate radio airplay both were only minor hits in the UK national charts, as was Cream's debut single, "Wrapping Paper". Peel favourites John Mayall & The Bluesbreakers also have a British Top Ten entry, even if the only UK chart successes they had were with their LPs. 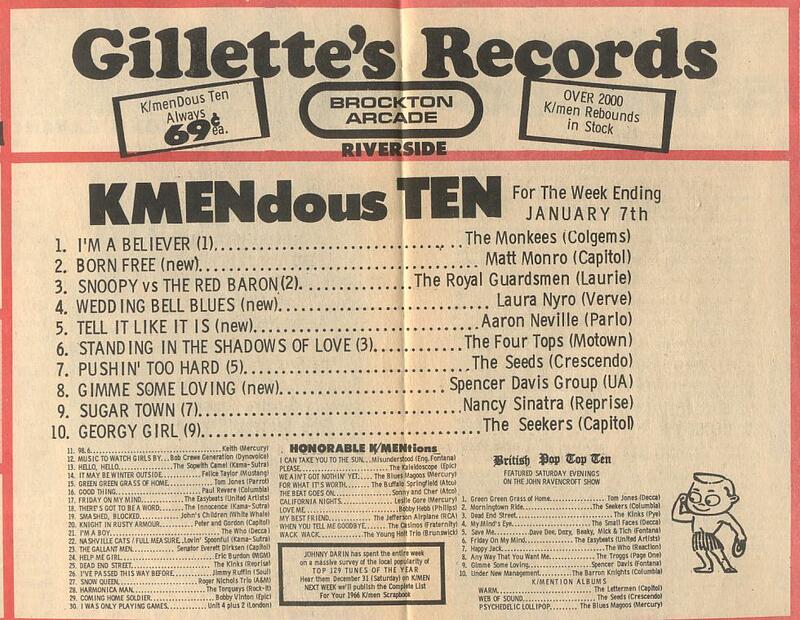 The British Pop Ten charts were also published, along with the station's main chart and other records on its playlist, in KMEN's weekly radio newspaper, the Kmentertainer. Worth pointing out that some dates of the charts, for example, week ending between 7th and 21st January 1967 had songs that were all in the same positions for 3 weeks. It is not known why this occurred. A song that failed to enter the UK Top 40 singles chart, but was in KMEN's British Pop Top Ten charts. Another group that failed to enter the UK Top 40 singles chart but charted on KMEN's British Pop Top Ten charts. John Mayall - "Parchman Farm"
A song that failed to enter the UK Top 40 singles chart but managed to get a place on KMEN's British Pop Top Ten. Who: Ready, Steady, Who E.P.